In October 2015 I delivered this paper at The State Library Of Queensland as part of its "How We Remember" symposium on the history of ANZAC 100 years on. It's good to be here in Brisbane for ANZAC Remembers, the scene of The Battle of Brisbane in November 1942 where Australia and U.S. servicemen went to war with each other before going to war with Japan. These are just 2 chapters in this city's wartime history, part of the mosaic of stories laced with calamity, heroism and luck - good and bad - that make up the true ANZAC experience across the generations. Yet for contemporary sports fans who so readily and needfully embrace the idea of ANZAC, they're unlikely to know either story. The Battle of Brisbane is probably thought of as the very first State of Origin game in 1980 when the late, great Arthur Beetson punched the suitcase out of his Parramatta team mate Mick Cronin at the legendary Lang Park. For AFL fans, The Brisbane Line is remembered as Simon Black, Michael Voss & Nigel Lappin - the exemplary Brisbane Lions midfield that delivered the club a hat-trick of Premierships a decade ago. More seriously, Australian sport has been a willing ally in the renaissance of ANZAC Day. Big on symbolism, short on detail and hostile to dissent, contemporary ANZAC culture has become Australia's chosen day to celebrate a singular notion of identity, virtue and sacrifice. ANZAC culture delivers huge crowds to dawn services, and applauding citizens line the roads of cities and towns as the parades of those who served - and their descendants - pass by. Where once these numbers were dwindling, they now fill our streets every April 25th. And at the heart of the rebirth of ANZAC day – in Victoria at least - is a game of football which, whilst draped in remembrance, is a civic spectacle that has become as much about us as it is about those who served. ANZAC day AFL football has become one of the biggest dates on Australia's domestic sporting calendar. It wasn't always like this - despite the relentless sales pitch about heritage and tradition. The rise of ANZAC football also coincides with the advent of the ANZAC industry - where commemoration has become commerce. Where it is as much about a return on investment as it is about returned service personnel. How did it come to this? And why has sport - and in this case AFL footy - become so central to ANZAC culture? Whose purpose does it serve when politics, sport and a creeping martial culture are drawn together to create an ANZAC identity that has become Team Australia's national orthodoxy - of who we are and what we value? How do those of us interested in the ANZAC story – and here I include all Australian involvement in military conflict - reclaim it as a living and more nuanced conversation about the world in which they occurred and how that informs who we are today? Because at the moment ANZAC is edging closer to simply being a brand to sell, a badge to wear, a tour to take - and a game to play. My childhood memories of ANZAC Day tell a very different story to the one experienced today. Could it really have been as different as I remember it? To check if my memories rang true I found the ANZAC Day front page of The Age newspaper from 1974, when I was a 6 year old boy. Not a mention of ANZAC spirit, sacrifice or gratitude. Certainly no word on any football game being played on that day. And no one even dared comment on what ANZAC Day said about being Australian. If The Age ran with that front page these days the minister for Immigration and Citizenship would be on the phone to the editor threatening deportation! My childhood memory of ANZAC Day was a mournful, sullen occasion. It was an awkward day when both citizens and returned service folks were quiet in their contemplation, reluctant to discuss their experience and wary of any nationalist sentiment that may be attached to the day. My only direct encounter with the ANZAC experience came from my mother’s uncle Desmond who was a regular visitor to our home. Des had fought against the Japanese, and after a few beers would rail against the Mitsubishi cars that had begun appearing on our street. Whenever ANZAC Day came round he would be scornful - wanting nothing to do with it. He saw it as phoney nationalism that made a mockery of the particular hell he'd been through. Refusing to attend the parade he'd sometimes sit at our kitchen table drinking whilst mum and dad poured him a beer, kept him fed and asked no questions. Whatever he'd been through, it seemed to us he'd earned the right to get through the day anyway he could. By the time I was a teenager Des had passed away. Like many of his generation their experience took its toll - and as a consequence, ANZAC Day was becoming a fading ritual. Des didn't live long enough to see the ANZAC renaissance. In 1981 Peter Weir's film "Gallipoli" reconnected a circumspect public to the ANZAC ideal. It did so by harnessing Australia's deep affection for itself as a nation of sports people ready to take on the world anywhere, anytime - and in this case at any price. Scripting the two main protagonists Archy (played by Mark Lee) and Frank (Mel Gibson) as sprint stars in search of adventure tapped a deep well of sentiment within Australia. It gave us a motif in which we could reframe our relationship with the ANZAC story. Australians have, for generations, fashioned a sense of national identity out of romanticising what we are not, or more kindly, what we would like to be. From the poetry of Lawson and Patterson, we created the Bushman narrative - a life lived free on the land - when we were and are one of the most urbanised societies in the world. Much more John Brack's "Collins St, 5pm" than "Clancy of The Overflow". A Ned Kelly narrative of a nation of larrikins with a rebellious heritage, when in fact, we did and do live with a garrison mentality, a culture of compliance and armed police forces, a nanny state that has rules about rules. And we imagine ourselves as a nation of sports stars, taking on the world and winning, punching above our weight - when the truth is we're largely a nation of couch potatoes with a world number one ranking in obesity. Because our current passion for ANZAC Culture also says as much about what we are not as it claims to say about who we are. The coalescence of ANZAC and a sporting identity is evidence of this. Still, I'm sure Peter Weir couldn't have known then what an impact his film would have. Thirty years on ANZAC Day has become an unrivalled cultural phenomenon. I often wonder what Uncle Des would have made of it if he were at mum and dad's kitchen table on ANZAC day now and as a mad Collingwood man, what he would make of the game of football played on that day. To understand how AFL football became central to the contemporary ANZAC experience we need to understand the game's long relationship with our military history. Football's alliance may well be an accident of history - but it's one that suits a valuable commercial purpose. Looking back at the recorded history of World War 1, sport is a minor footnote in a history weighed down by senseless slaughter. As pointed out by Dale Blair in his article in The Journal Of The Australian War Memorial on sport and Australia at war - of the 12 volumes of "Official History of Australia in the War" by legendary historian C.E.W.Bean- only 1 is dedicated to the homefront and sport rarely raises a mention and then only in clumsy metaphors for war. In fact, around the First War, there was genuine tension between VFL football and the military when universal conscription in 1911 required all youths aged between 14 and 20 to undertake some form of compulsory military training. With Saturday as the designated day for drill, absenteeism plagued the conscription scheme with many young men choosing to play or to attend football matches rather than march to the beat of military drums. And trust a Leach to be one of the leading ratbags! Arthur Roy Leach was one player fined for being absent for military duty when he fell 57 hours behind his drill attendance because he was playing football with a club in the VFA. One wonders if those filling the MCG in patriotic fervour on ANZAC Day now would be so keen to attend if it were a compulsory drill session and military training. This tension between football and military service also exposed a divide within the community at the time about the function of sport. The culture of amateurism that underpinned sport in the middle-class schools at the outbreak of war was rooted in notions of muscular Christianity - of virtue, sacrifice, loyalty and courage. In working class communities, sport was seen as a necessary release and escape from the privations of work and struggle - and where possible, a chance to make a few extra pounds along the way. Funnily enough - I've discovered this divide still lingers within the Victorian football community. The VAFA - Victoria's amateur football competition - is still very much embedded in the Old Boys of the big private schools – the clubs are called St Kevin’s Old Boys, Old Melburnians, Old Xaverians. Even now, it's a constant struggle to retain its best players with the burgeoning semi professional leagues in the suburbs who can offer up to a $1000 a game for better players. Still, in 1915, this divide became a source of conflict within the VFL. Was sport - and in this case football - frivolous and an indulgence at a time of war? Certainly, the pious amateurs thought so - all competition was abandoned until the war's end. The VFL's rival competition, the VFA, pulled up stumps in 1915 and didn't return until 1918. And the VFL was in turmoil. By 1916 only 4 teams - the working class inner city clubs of Collingwood, Fitzroy, Richmond and Carlton competed. Laced into the metaphorical bootlaces of all of this were the huge Catholic populations within those clubs whose communities were hostile to the conscription push from Billy Hughes, and mindful of the struggles in Ireland that were coming to a head. Clubs would eventually return to the competition - but one would be lost altogether. University, which drew its players from Melbourne's growing student population, was so decimated by the events of the war it would never recover. Interestingly, this cultural conflict within the history of the game doesn't raise a mention when football marks ANZAC today. There was an uneasy alliance between the VFL and the military, with recruitment drives and fund raisers held at VFL games to assist the war effort. Carlton played a military combination team at the MCG in 1915 after the Grand Final that year and drew a huge crowd. With forces overseas, football was also played where time allowed - most famously a match held at The Queens Club in London in 1916 before a crowd of 3000 and The Prince Of Wales. In the records, there are descriptions of games elsewhere on the continent during the conflict, even one on The Somme between the 27th & 28th Battalions. In Weir's film football is also played as Frank and Archy are preparing to ship out of Egypt. Here we see football as an expression of cultural identity for Australians overseas - of youthful exuberance and vitality - an act of defiance in the face of tragedy. In that context football - not military service and slaughter in the service of a distant monarch and empire - reflected a real sense of what it meant to be Australian. It's always puzzled me that the AFL/VFL's unique and tragic history in World War 1 with the demise of University Football Club has rarely rated a mention in the commemoration of the event. University surely represents the very embodiment of the wholesale destruction of a generation, a profound and shocking concentration of loss that mirrors the appalling waste of that war. Yet it remains a story unknown to most football fans. Is it too potent, too stark a story for Football's ANZAC tradition that tends to deal with big themes and idealism and seldom in heartbreaking and confronting detail? With football's uneasy history with The War to End All Wars, how did it come to pass that it would one day be so central to ANZAC Day itself? In the age of the million dollar professional I can see the appeal for contemporary football to align itself to the ANZAC story and the associated values of muscular Christianity - selflessness, sacrifice, virtue and service. It offers a higher moral dimension, beyond the commerce and salary caps. Contemporary AFL football is, in reality, light years away from these values. Yet the game's lifeblood – especially for fans - remains its links to the past: football thrives on memory, real and imagined. With routine attendances above 90,000 at the MCG on ANZAC day for The Essendon v Collingwood game, it's easy to be convinced when you're told this is a product of tradition and heritage. True, VFL football on ANZAC Day began in 1960 after the Victorian government passed the ANZAC Day act in 1958 which allowed organised sport to be played after 1pm on ANZAC Day with some proceeds going toward the ANZAC Day Fund. The VFL/AFL continued to schedule ANZAC Day fixtures to coincide with ANZAC day for the next 34 years with a minimum of fuss or fanfare. ANZAC Day football was rarely seen as part of the memorial culture of the day, and the crowds that attended drew no special inference from the occasion. To illustrate the point - in 1994, the year prior to the rebirth of ANZAC Day football, St.Kilda played Richmond at the old Waverley Park in front of 37,370 spectators. It was just another day at the football. So what changed things? Kevin Sheedy, that's what. Sheedy was then in his prime as coach of Essendon and was seen as the game's leading thinker. A former national serviceman during the Vietnam era, Sheedy had always held his military history as a formative experience. 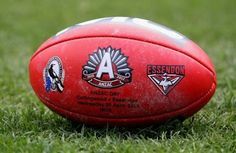 Along with then Collingwood Football operations manager Graeme Allen he proposed to the AFL a single game on ANZAC Day, between Melbourne's 2 biggest clubs - Collingwood and Essendon. In conjunction with the ‘Australia Remembers’ festivities marking the 50th anniversary of the end of World War 2, Sheedy was calling on football to reimagine and renew its relationship with ANZAC Day. In his wildest dreams he couldn't have imagined what was to follow. An epic game played in front of a sell out crowd at the MCG, Collingwood and Essendon played out a thrilling draw. The result came to be seen as emblematic of the occasion - just as there are no real winners in war, so shall there be none here. And so, a legend, a manufactured tradition, was born. It's interesting to note that Sheedy's campaign to reenergize ANZAC in football coincided with Paul Keating's attempt to broaden ANZAC – moving away from such a focus on the shores of Gallipoli. Keating, a staunch republican and cultural nationalist, had reoriented Australia's gaze toward those who fought at places like Kokoda, Buna and Gona in New Guinea - those like in the 37th,38th and 39th Battalions who held the Japanese at bay in the Second World War. Keating saw ANZAC day as a chance to attest to the need for a new Australian independence and self-reliance. As his ill-fated mission for an Australian Republic was then also gathering momentum, ANZAC Day was coming to life with a new sense of Australian optimism. Keating was also reshaping how Australia saw itself in the world, shifting our focus from our European heritage and reorienting Australia towards its Asian neighbours. What more recently has been described as a pivot to Asia - well ahead of the US.It was in that context ANZAC day 1995 unfolded. There was a genuine thirst for knowledge about previously forgotten aspects of Australia's war past that might tell us something new about ourselves. I'm not sure that same spirit imbues contemporary ANZAC Culture which seems to me to be more about asserting the primacy of old values and dominant culture over anything that challenges it. As we all know, Australia’s image of itself has undergone a radical transformation since the Keating years. Hansonism, 9/11, Tampa, Bali, Iraq, Afghanistan and more recent turmoil have made us a more insular, insecure people. Rather than celebrating ANZAC Day in the spirit of gratitude and with a sense of confidence and optimism for what those sacrifices have afforded us, we fell back on the ANZAC ideal as reassurance and security from threats both internal and external. If anything, through ANZAC Day football it became less about the universal suffering in war - a condition common to all combatants - and more a monument to a perception of the national character. And in the age of spectacle - ANZAC football provides the perfect forum for a grand affirmation of a prescribed set of values and aspirations that suit our needs but may bear little relationship to the hopes, aspirations and values of those who served. The success of that first Collingwood v Essendon game was a delight to the AFL which at the time was in turmoil. It was watching on as one of its oldest clubs - Fitzroy - struggled to stay alive. It would soon be banished and subsumed into what became known – and loved - as the Brisbane Lions, but generations of Roys fans would be disenfranchised from the game forever. Two other clubs - Melbourne & Hawthorn were in financial distress and would spend all 1996 in a state of civil war over a proposed merger. AFL footy needed a good news story and the success of ANZAC Day was the perfect tonic. Success can be a burden too though, and this was quickly the case as this new enthusiasm for ANZAC Day football became contested ground. The deal done by Sheedy and Allen locked all the other AFL Clubs out of the ANZAC experience. Essendon & Collingwood became “ANZAC Clubs” and by inference were seen as worthy to represent the sport on a sacred day in preference to their competitors. The medal awarded to the best player on the ground - The ANZAC Medal - could only ever be won by a Collingwood or Essendon player. This created a schism in football as the other clubs resented the distinction. They also resented the windfall such a day represents. It is here that we can trace the origins of what I referred to back in a column I wrote on the issue in 2010 as The ANZAC Industry. ANZAC Day football was becoming big business. It had become the Melbourne Cricket Grounds 3rd biggest day of the year in terms of gate receipts and other revenues behind Boxing Day Cricket and The Grand Final. The caterers, the beer companies with exclusive pouring rights, the merchandise stalls and the corporate box sales were delivering huge profits out of the day. Associated events, travel packages and functions surrounding the game were mimicking the type of corporate festivities associated with Grand Final Day and The Spring Racing Carnival. The AFL could sub divide ANZAC Day football as a property to sell in its negotiations with rival TV networks desperate to secure broadcast rights for the big day, ensuring that the price was pushed up significantly. As the only game in town that day ANZAC Day was a huge ratings winner for the host broadcaster who could charge the requisite advertising fee to commercial partners who were desperate to reach a captive audience. ANZAC Day football may well have been a rich experience for those attending - but it was making a lot of people rich on the way through. And it’s becoming increasingly hard to work out what is being reembered- The stars of the game or those that served. Commemoration had become commerce - and it seemed nothing was off limits. In 2010 Collingwood went too far. In an ad run on the station I was then working for - 1116 SEN sport radio, The Magpies were advertising a 3 match membership package which included a ticket to The ANZAC Day game. Then captain, now coach, Nathan Buckley read the ad with the membership offer over the plaintive strains of the last post. Alarmed and appalled at this blatant and crass exploitation of ANZAC Day’s most solemn moment, I informed the RSL in Victoria who, as you can imagine, were less than impressed. To Collingwood’s credit, they recognised they’d crossed the line and withdrew the ad. When I later inquired of both Collingwood & Essendon just what sort of contribution they were making to the RSL and Legacy from their regular ANZAC Day windfall they were silent. No one owns Anzac Day; it lives in the memory of those who served. And the size of the crowd at a football match is irrelevant. The silence of a few gathered in solemn contemplation is just as profound as that of the tens of thousands who might do it at the MCG. And the clichés about sport and war, sacrifices and mateship and playing with “The Anzac spirit” could only be uttered by those of us lucky enough not to have had our lives and those of our loved ones ruined by war. To my mind, those words are as true now as they were when I wrote them in 2010. I want to make it clear that I am not questioning the sincerity of those who attend dawn services, applaud at parades, or stand in silence at the MCG on ANZAC Day. They participate in the belief that the day - and the game - represents the best of what they see in themselves as Australians. Communicating the complexity, diversity and authenticity of the ANZAC story – and by that I mean the story of all Australian engagements in conflict- is a real challenge, but one that falls to all of us - to grapple with it and ensure that ANZAC culture doesn’t become a simply national blood myth. And my concern is that ANZAC Day football is in danger of becoming the centrepiece of such a myth. As living history, the ANZAC story needs to be contested ground - a place where questions can be asked, stories good and bad shared, ideas challenged and debated. It will take a different kind of courage of to continue to discuss the who, how and why of the ANZAC story and what impact it has had on how we have become the nation we have. That, to my mind is the best way to honour those who served and sacrificed. It was Gunner Edward S. Webster of the Australian 2/2nd Anti-Tank Regiment who was killed as he wrestled an American MP amidst the chaos and violence of Americans and Australians brawling in the streets of Brisbane that night in 1942. Whilst Gunner Webster will never be mentioned in dispatches at the MCG on ANZAC Day as a hero to be remembered, it’s our job to make sure that his story is told. It’s not the proudest moment in our ANZAC story, but it’s is important to the fabric and richness of that history. AFL Football has played a remarkable role in the reframing of ANZAC Day, and offering another platform for national pride. Its next challenge is to encourage a more sophisticated view of our history – which will surely also support a more nuanced, dare I say tolerant, view of our contemporary society. Not all soldiers – or footballers - are heroes. Not all battlefields – or playing fields - are glorious. the ANZAC story deserve more than clichés. More than stereotypes. And what we choose to forget - and how we decide to remember - will determine whether we are truly capable of honouring their legacy.